This Saturday, we have a sale you don't want to miss and an amazing line-up of local and national creative women for you to meet. You'll meet women-in-comics trailblazer Barbara Randall Kesel and the first woman to ever write a Transformers comic book Mairghread Scott (her new title Toil and Trouble is a fantastic read). On the locals front, you'll meet Sacramento favorites Julie Okahara, Madelyne Templeton, Etta Jean, and many more. 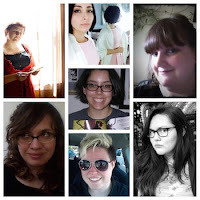 PLUS, we have some creative women who are completely new to the con scene. Want to know who else will be there? Here's the complete Creative Women Mini-Con listing. Time: Starting at 11 am. Everything is on sale this Saturday. Here are the details. *Savings Club Members, be sure to check your email for your October 2015 Member Bonus. You're going to love what you find. (Not a member? Learn how to join in this email).